The removal of thrombus under the image guidance, endovascular thrombectomy is preferred for an arterial embolism which is characteristic for an arterial blockage frequently caused by atrial fibrillation, a heart rhythm disorder. An arterial embolism causes restricted blood supply which leads to pain in the affected area. A thrombectomy can too be used to treat conditions in your organs which is usually associated with less benefit and more risk, a large retrospective study found. Alejandro Spiotta, MD from Medical University of South Carolina in Charleston stated that functional independence rates were 45% for those treated in less than 30 minutes, 33% with procedures 30 to 60 minutes long, and 27% when procedures took more than 60 minutes. The results indicate that complications double after 50 minutes and the mortality risk is significantly for the over 60-minute group than in those treated in 30 to 60 minutes. Earlier research has shown that when it comes to mechanical thrombectomy, procedure time has a noteworthy effect on patient outcomes. Based on these findings, it seems reasonable to conclude that at 60 minutes, one should consider the futility of continuing the procedure. However, procedures that last longer were connected with increased cost, worse outcomes, and increased incidence of complications, the investigators noted. Yet, the findings underscore the importance of timely recanalization and suggest there’s a point at which continuing to manipulate the intracranial artery may not be helpful for the patient. Spiotta’s group evaluated 1,357 participants at seven U.S. medical centers, but only 12% out of the patients showed signs of posterior circulation stroke and 46% of cases received IV tissue-type plasminogen activator. The scientists use a prospectively-maintained database which consists of clinical and technical outcomes and baseline variables and can evaluate patients that underwent endovascular thrombectomy with direct aspiration as first pass technique or a stent retriever. They collected their experience with the benefit of hindsight and joint it together, so there’s always a chance of case ascertain bias or other bias in the collection of the cases. One limitation is the fact that these are quality, busy centers, and the results might even worse if less experienced centers were included. It’s a little bit like getting the cream of the crop and analyzing their data. Upcoming studies should gather data on the relationship between specific thrombectomy devices and techniques and the success of recanalization procedures for patients with AIS. Two novel therapies for patients with metastatic gastric cancer were evaluated by Dr. David H. Ilson of Memorial Sloan Kettering Cancer Center in New York City. In one study, trifluridine/tipiracil (FTD/TPI) was revealed to be an effective treatment for patients with metastatic gastric cancer. On the other hand, the monoclonal antibody andecaliximab plus the chemotherapy regimen mFOLFOX6 (mFOLFOX + ADX) as a first-line treatment in patients with advanced gastric or gastroesophageal junction adenocarcinoma failed to improve overall survival. He has shown the only potentially curative treatment for early stage gastric cancer is surgery, with 5-year survival rates after gastrectomy of 90% or more in Japan and Korea and 40% to 75% in non-Asian countries. Still, the disease reappears in up to half of patients, while 40% of patients with metastatic disease have had a previous gastrectomy. The phase III TAGS study had established that FTD/TPI is safe for patients with severely pretreated metastatic gastric cancer. In this study, Ilson and his colleagues appraised the efficacy and safety of the FTD/TPI in patients with or without gastrectomy. Of the 507 patients in the study, 147 in the FTD/TPI arm had a prior gastrectomy compared to 74 in the placebo arm. The study enhances the benefit of TPI as prolonging surviving versus placebo. 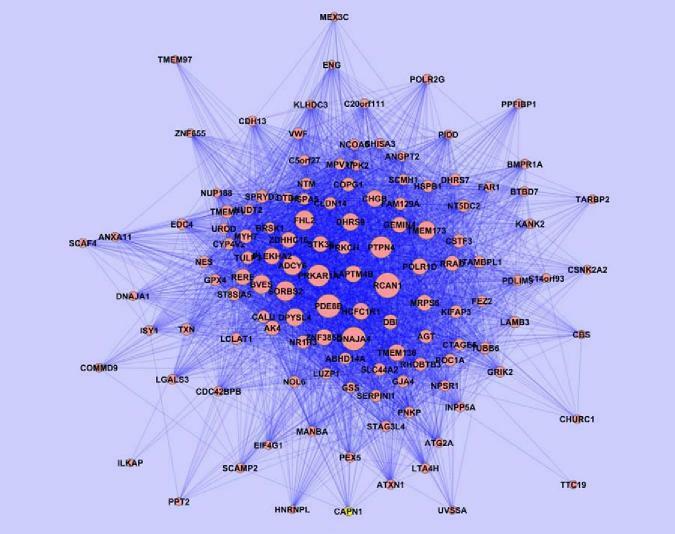 According to Dr. Manish A. Shah, the mixture of mFOLFOX6 and ADX exposed encouraging anti-tumor activity in patients with gastric or gastroesophageal junction adenocarcinoma according to a prior I/IB study. He showed a phase III, randomized, double-blind, multicenter study associating the efficiency and safety of mFOLFOX with or without ADX in patients with untreated HER2-negative gastric or gastroesophageal junction adenocarcinoma. The main endpoint was complete survival with secondary endpoints of evolution free survival, objective response rate and safety. According to Dr. Shah, thee apparent increased activity of the mixture of mFOLFOX with ADX in patients ages 65 or older needs further study. Robert A. Harrington, MD: Hi. This is Bob Harrington from Stanford University on Medscape Cardiology and the heart.org. Thanks for joining us today. Over the last couple of months, I have interviewed a couple of physician authors who have commented on some of the issues of the time, whether that’s related to the electronic health records, as in our discussions with Bob Wachter, or the revolution that’s taking place with wearables and patient centric data, as with my conversation with Eric Topol. These shows have been well received, and those conversations were useful to the community to have a frame of reference not just in regard to the daily practice of medicine but also in terms of how the bigger issues in society around digital health, wearables, electronic records, etc., might influence the practice of medicine. Today we’re also going to interview a physician author but with a different approach to some of the issues within medicine. He is trying to get at how physicians and other clinical providers take what we learn from the literature, from scientific studies that have been done, and use some combination of statistics coupled with the art of caring for other human beings in a way that ends up with first-rate medical care. And this author not only wondered how we do that but also how we begin to think about teaching that to our trainees, to our students, our residents, our fellows, etc. I’m really pleased to have with me today the author of the book, The Science of the Art of Medicine, which is just coming out in its second edition. The author is Dr John Brush. John is a professor of medicine at Eastern Virginia Medical School and a practicing cardiologist in Norfolk, Virginia. John and I are friends and colleagues through his service as a recent board of trustee member for the American College of Cardiology (ACC). John, thanks for joining us here today on Medscape Cardiology. John E. Brush, MD: Thanks very much, Bob. It’s a pleasure being here, and I look forward to our conversation. Dr Harrington: You heard my opening remarks reflecting on you as a physician author. What made you write this book? What were some of the issues that compelled you to put pen to paper, so to speak, and try to formulate some view of the world in medicine as you saw it? Dr Brush: One of the origins of this book was actually my work with the ACC related to quality of care and quality and care initiatives. I was chairman of the Quality Strategic Direction Committee for 3 years and really got thinking about quality and why people make errors. What leads to good judgment? What leads to bad judgment? And that led me to stumble upon the cognitive psychology literature. When I was in college, there was no such thing as cognitive psychology; it was mostly behavioral psychology. The field of cognitive psychology has arisen in the past 30 years. Cognitive psychologists are interested in understanding how people make decisions. Doctors make decisions every single day, and yet we don’t teach anything about cognitive psychology, and we don’t learn anything about it in medical school. It seemed like it was a relevant area to think about, and so I jumped in. I taught myself cognitive psychology. I bought book after book after book and just decided I was going read about it. What cognitive psychologists have figured out is that we’re not purely rational; we think we are, but we make mistakes. We fall into typical traps. We have biases because we use heuristics or mental short cuts to try to make rapid decisions under conditions of uncertainty. If you think about it, that’s what doctors do every single day: make rapid decisions under conditions of uncertainty. I wanted to learn more about it myself. And then the more I read about it, I jokingly said to my wife, “You know, I could write a book on this stuff.” And then I stumbled on this ibook authoring tool, and I figured out that it’s actually easy to write an ibook—easier than I thought. And so I said, “I am going to write a book about it.” I thought it was going to take me 5 years; it took me about 3 months because I was so consumed by this. Dr Harrington: Before you dive further, let me ask you a couple of things about cognitive psychology because it is interesting that you took this observation of people making errors and then did the deeper dive, which I applaud you for. I’m thinking of some other authors in this area that some of our listeners might know about, such as Dan Ariely from Duke and the book,Predictably Irrational. Would you put that in the context of cognitive psychology? Dr Brush: Yes, he’s a well-known cognitive psychologist. There’s also Daniel Kahneman who wrote, Thinking Fast, Thinking Slow. Daniel Kahneman is from Princeton and a very prominent writer in cognitive psychology. A guy named Gerd Gigerenzer from Germany has written books on risk and how to evaluate risk—basically how to think about probability. His books were very influential for me. There’s Herbert Simon who was a computer scientist in Pittsburgh, and he is generally thought of as the father of cognitive psychology; he was at Carnegie Mellon. Cognitive psychology is also referred to as behavioral economics, by the way, and both Herbert Simon and Daniel Kahneman have won the Nobel Prize in Economics. Dr Harrington: That’s what I wanted you to get at for the audience—that it’s not just interesting, but it’s useful to read outside of medicine and then bring those ideas into how we think about medicine. You’ve hit upon something in that we don’t teach our students and resident how people actually make decisions, but, as you’ve described, that’s what a clinician does every day. You said that the ibook was an easy thing to do. Why did you pick a book and not write a commentary for a journal or give a lecture on the topic? Why did you go right into a book? That’s a pretty big leap. Dr Brush: The topic is too broad to cover in a single lecture or single commentary. I did write a series of blog posts that were posted on cardioexchange.org. Harlan Krumholz invited me to do that, and it was very helpful because it enabled me to collect my thoughts and to test out ways of explaining this. One of the challenges is explaining a subject matter that is outside medicine. You’re bringing a new area to people’s attention, and so you have to figure out how to go about explaining it. I’d done this series of blog posts; I did a series of lectures for our residents here in Norfolk. And I have to tell you that the first lectures I did on this utterly failed because they were dull, they were boring. I had to figure out how to make it interesting because if you discuss it in the setting of a patient and you study it on rounds, it’s absolutely fascinating. But if you talk about it in isolation, it’s like a statistics course in isolation where the subject matter is too dry. The way you make it interesting is by relating it to patients, so I started collecting examples, and there are simple examples in cardiology. Cardiology is the ideal place to teach medical reasoning because we almost get immediate feedback. You can put your money down and make your bets as to whether somebody is having a myocardial infarction or whether somebody has heart failure or whether somebody has a pulmonary embolism. Generally by the next day you find out, and so you get this immediate feedback where you can train your intuition. We have so many numerical things from troponin levels, D-dimer, stress tests, and what have you. You can begin to develop estimates of probability so that you can start to calibrate your intuition. And there’s no better place in medicine than cardiology to that as an exercise. Dr Harrington: One of the things I love about the book is that you spend time, particularly at the beginning of the book, going through the basics of statistics that help us in the practice of medicine. And one area you spend time talking about is Bayes’ theorem and the notion that while we use both frequentist and Bayesian statistics in medicine, in many ways clinicians are natural Bayesians, aren’t we? Dr Brush: We are, but we don’t think hard enough about what that means. We wander into being Bayesians, and we pick that up in our training. It’s a good idea to step back, dig a little bit deeper, and ask exactly what that means. The cognitive psychologists tell us that we make mistakes by deviating from a normative mode of thinking in one of two ways. We either do things that are illogical, or we make bad probability estimates. I wanted to think about the logic of what we do as well as the probability. I talk a little bit in the book about deductive reasoning and inductive reasoning, but really what we do is something called abductive reasoning, where we reason to the most plausible hypothesis. Most of the time, we don’t really know. If somebody comes in with heart failure, we think it may be untreated hypertension or alcoholism or whatever, but we don’t really know. We reason towards the most plausible hypothesis. When we’re using Bayesian reasoning, we’re using probability estimates, and so knowing something about probability is a good idea. We think that we know about probability because we play cards, we throw dice, we play games of chance all the time, but probability can be simple and complex and complementary and cumulative probability and conditional probability. Bayesian reasoning is all about conditional probability. We think like Bayesians, but we never do the calculations. Instead we use a heuristic called anchoring and adjusting. Anchoring and adjusting is a natural way that you use Bayesian reasoning where you come up with an anchor, which is your pretest probability, and you adjust that anchor (that pretest probability) based on new information to give you a posttest probability. We intuitively know how to use this heuristic called anchoring and adjusting, and that’s actually what we do in practice, rather than pulling out our calculator and calculating the Bayesian probabilities. Dr Harrington: What you’re describing in part is what makes the great clinician, and the great clinician as you described has to have a grounding in statistical methods, has to understand what probability is and how one thinks about it. At the same time, the great clinician has to have a body of experience upon which to anchor that probability; and then finally, the great clinician has to be able to be observant and trust his or her intuition. Is that a reasonable way to put it? Dr Brush: When you look back on your colleagues or mentors who just seemed to get it, one characteristic that describes the person who just seemed to get it is that they made good bets. They had a good sense of what’s most likely, what’s least likely. They were savvy about how they made those calculations. They had good intuition about how they made those judgments. How do you teach that? Well, you can teach people about the processes and give them an idea of where they want to be at the end of the day. If you can break it down a little bit, it helps. You can use simple numbers. If you simplify the numbers, you can use the numbers to calibrate your intuition. There’s something in medicine that we are leaving out. We talk all the time about sensitivity and specificity, and yet when you ask physicians, “give me a quick definition of sensitivity and specificity,” they’re not able to do it. You lose track of what’s in the numerator and what’s in the denominator. People get all balled up with those definitions that sensitivity relates to true positive and specificity to true negative. That’s a little bit more descriptive of what you’re actually talking about. But there’s something even better, and that’s likelihood ratios because a positive likelihood ratio is the probability of something divided by the probability that something is not there. It’s the evidence for something divided by the evidence against it, and so it’s a dimensionless number. You don’t even have to keep track of what’s in the numerator or the denominator because it’s a dimensionless number. Likelihood ratios are incredibly powerful. Say you’re trying to teach a trainee how important a positive troponin is. How important is a positive nuclear stress test? How important is a D dimer? If a D dimer test is negative, that is a very important negative piece of information; but if it’s positive, it’s not quite so strong. That’s because the positive likelihood ratio for a D dimer is about 2, and the negative likelihood ratio is more like 0.1. You can use likelihood ratios to really hone your intuition, which is very useful when you’re trying to import years of wisdom to new trainees. You can’t wait 30 years for them to finally get it; you want then to get it on Day 1. We’ve been talking about diagnosis so far, but for therapeutics you need to figure out how to calibrate your intuition on treatment decisions. The inverse of the absolute risk reduction is the number needed to treat, and the smaller the better. If you’ve got some sense of what a good number needed to treat is, then suddenly you can calibrate your intuition about what’s really important and what’s not so important. Beta blockers and aspirin and angiotensin-converting enzyme inhibitors are really important; maybe glycoprotein IIb/IIIa antagonists are less important. The number needed to treat gives you a way to gauge the importance of therapeutic interventions. Dr Harrington: I love the direction you’re going, which is to take what we do and recognize that there’s a science behind it. For a lot of the therapeutics you just mentioned, there are clinical trials that inform us about what those numbers needed to treat are and what the numbers needed to harm are. But as you rightly said, the art of medicine is understanding who is likely to benefit from this particular therapy when you make that bet. We’re not yet in this era of precision health of being able to say, “Based on your characteristics (which may include genomic characteristics), you are more likely to benefit from this and less likely to benefit from that.” But you’re helping move us to that, and I love that you’re helping us think about a framework for teaching it. You clearly wrote this as a teacher to students, and whether that’s a teacher to a colleague like me or a teacher to residents, students, and fellows in some ways doesn’t matter. What’s been the reaction from the student community, “student” being broadly defined? You can see the light bulb turning on, and they really appreciate it. It also helps them get a handle on uncertainty. Uncertainly scares the heck out of us when we’re in training. Some of us run away from it and create this illusion of certainty, but—let’s face it—the uncertainty and the ambiguity of medicine scares the heck out of all of us. But it really scares people during training, and you don’t know whether you don’t know it or whether it’s unknown to everybody. You don’t know the level of uncertainty of things, and by addressing that straight on, you can try to get a handle on how you can reason through that uncertainty and how you can move from a place where you don’t know to a place where you have a better idea but also understand that there are some things that you’ll never know for sure but you’ve got to get as close as you can. For the residents that I work with, that takes a little bit of pressure off and helps them. It helps them grasp what the challenge is, and the challenge is learning as much as they possibly can, getting as much experience as they can so that they can put it all into action in a way that’s systematic and organized and tends to make sense. Dr Harrington: John, my last question for you: What have you learned from this? You entered this as a student trying to understand decision-making, and it led you to an exploration of cognitive psychology. You felt that it would help make you a better teacher, and you wrote a book. What did you learn from the whole exercise of the last few years? Dr Brush: I’ve learned so much about cognitive psychology, about probability, about logic, and that has helped me be a better decision-maker in general. Even beyond medicine, but certainly it’s made me a better clinician and a better teacher. I’ve been able to articulate what I’m thinking in a way that makes better sense to students. What I’ve learned, though, is that we’re not teaching this, and we’re also not testing on this. It’s much easier to test on content; you can turn some medical fact into a multiple choice question a whole lot easier than you can figure out whether somebody actually gets it and is able to put the knowledge into action. We don’t want to just impart knowledge; we want to impart wisdom. We want to be able to use knowledge wisely. We’ve now got this rush of information that’s coming at as from every direction over the Internet and in so many different ways. We need to turn that information into knowledge that helps us get closer to the truth, and to do that we’ve got to learn how to use the knowledge wisely. As a community of physicians, of professionals, and also a community of academicians, we need to think about how to teach this stuff. How do we test it? How do we develop competencies in this area? For me, it’s created a whole new way of looking at medical education and really what matters and what we really ought to be concentrating on. Dr Harrington: This has been a fascinating conversation, John, and I applaud you for taking the initiative not just to learn the background material but to write the book and share it with the rest of us. And I certainly recommend to our listener audience John Brush’s book, The Science of the Art of Medicine. You can get it through iBooks or you can get a hard copy of it. So my guest today has been Dr John Brush, a professor of medicine at Eastern Virginia Medical School and a practicing cardiologist in Norfolk, Virginia. John, thanks for joining us on Medscape Cardiology. This article is about the measure of central tendancy and dispersion of values around the center (mean or median), the underpinning of parametric methods of comparison of 2 or more sets of data. More importantly, it is the beginning of a statistical journey. The clinical laboratory deals with large volumes of patient data. The use of a parametric approach is limited and is prone to problems introduced in the clinical domain. Consequently, Galen and Gambino introduced the concept of predictive value and the effect of prevalence in a Bayesian context in Beyond Normality. These calculations work off of tables, the same tables that are used for sensitivity and specificity, and are used to calculate a chi squared probability. The subsequent influence of epidemiology went further in introducing odds and odds ratios. The third and last article will address the more recent advances beyond, beyond normality. These improvements have all come about by the development of a powerful statistical methodology that is not constraint by the parametric paradigm and is well developed for hypothesis generation and validation, not just testing of simple hypotheses. We have grown up with the normal curve and have incorporated it in our thinking, not just our work. 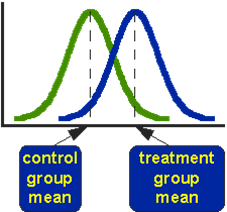 Even the use of the term Six Sigma for reduction of errors has reference to the classical “normal curve” introduced by Johann Carl Friedrich Gauss (1777–1855). The normal or “bell shaped” curve is a plot of numerical values along the x-axis and the frequency of the occurrence on the y-axis. If the set of measurements occurs as a random and independent event, we refer to this as parametric, and the distribution of the values is a bell shaped curve with all but 2.5% of the values included within both ends, with the mean or arithmetic average at the center, and with 67% of the sample contained within 1 standard deviation of the mean. The reference to normality has been used with respect to student test scores, with respect to coin flipping and games of chance, with respect to investment, and in our experience with respect to errors of quality controlled measurements. The expected value we refer to as the mean (closest to the true value), and the distance from the mean (or scatter) we refer to as dispersion, measured as the standard deviation. Viewed in this light, we can convert the curve from a standard curve with an actual mean to a standard normal curve with a mean at the center of “0”, and with distances from “0” in standard deviations. A bad example of this is the distribution of serum AST measurements of a large unselected population enrolled in a clinical trial. The AST values tend to have many high values, which we call skewness to the right of the curve, so the behavior we are looking for is better described by a log transformation of the values to minimize nonlinearities in the measurement. 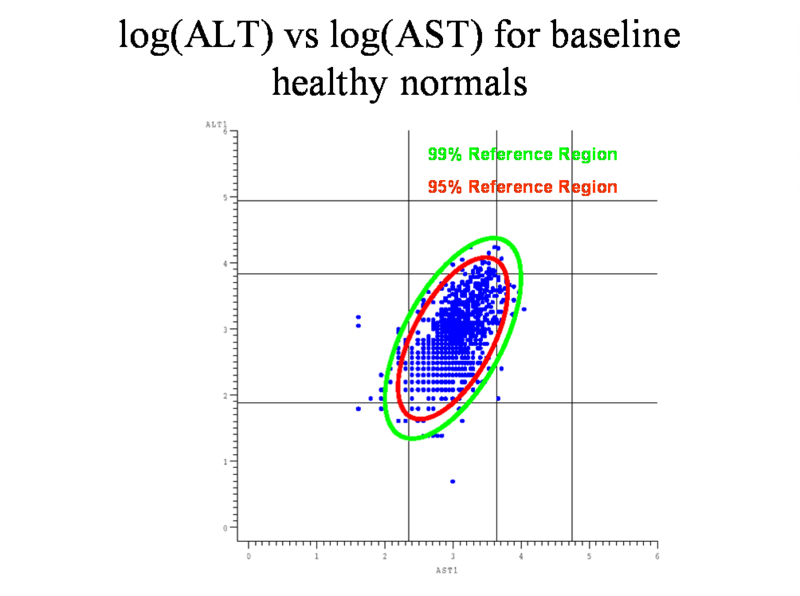 This is illustrated by the comparison of AST and log(AST) in Figure 1. What has not been said is that we view a reference range in terms of a homogeneous population. This means that while all values might not be the same, the values are scattered within a distance from the mean that becomes less frequent as the distance is larger so that we can describe a mean and a 95% confidence interval around the mean. In mineralogy we can measure physical elements that have structure defined by a relationship of structure to spectral lines. Hence, the scatter about the mean is very small because of the precise measurements, even though the quantity may be very small. This is not necessarily the case with clinical laboratory measurement because of hidden variables, such as – age, diurnal variation, racial factors, and disease. One way to level the playing field is to compose uniform specimens for quality control that are representative of a population for comparison of laboratory measurements among many laboratories, which is established practice. What is assumed is that a “normal” population is that population that is found after we remove bias, or contamination of the population by the hidden variable effects mentioned above. Therefore, parametric statistics is actually a comparison of one or more populations that are to be compared with the hypothetical normal population. The test of significance is a comparison of A and B with the assumption that they are sampled from the same population, but when they are found to have different means and confidence intervals by a t-test or an analysis of variance, we reject the “null hypothesis” and conclude that they are different based on a p (significance) less than 5%. There are basic assumptions that are required when we use the parametric paradigm. 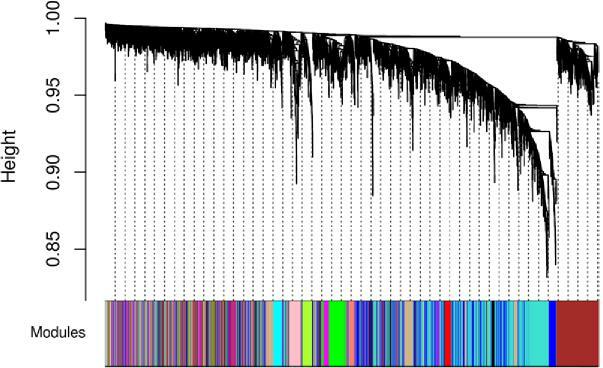 The distributions of the samples are the same, normality, the variances are the same, and errors are independent. Consequently, when comparing 2 samples, as for a placebo and a test drug, these assumptions must hold (which is inherent in the logistic regression). When we run quality control material, the confidence lines that we use are equivalent to a normal curve turned on its side. When doing the t-test, the parametric limitations have to be followed. A result of this is that a minimum of 40 samples are required because as N approaches 40 and over the fit of the data to a normal distribution is more likely. This is a daily phenomenon in laboratories globally – it takes about 10 – 14 days to be confident about the reference range for a new lot of quality control material, regardless of high, low or normal. Nevertheless, we have to ask whether we can use a small sample size to validate the reference range of a population sample. The answer is not so simple. One can minimize sampling bias by taking a sample of blood donors who are prescreened for serious medical conditions. The use of laboratory staff donors historically introduced selection bias when the staff was uniformly younger. On the other hand, the amount of computing power readily available to the average practitioner has substantially improved in the last 5 years, and middleware may offer a further opportunity for improvement. One can download a file with two weeks of results for any test and review and exclude outliers to the established values for the method. The substantial remaining sample has at least 1,000 patients to work with. Another method would use a nonparametric adjustment of the data by randomly removing a patient at a time and recalculating. We are not here concerned with distributional assumptions and population parameters. We work only with the data, and we observe the effects of recalculation. That is an uncommon and unfamiliar approach. We proceed to the important problem of comparing 2 variables. Figure 1 is a bivariate plot of data with log(AST) and log(ALT) on each axis. The result is a scattergram with 95 and 99 percent confidence limits for a reference range formed from two liver tests that meet the parametric constraints. The scattergram shown in Figure 2 may show correlation, method A and method B, distinctly different, but having a linear association between them. The parametric assumption holds, and the confidence interval along the so called regression line is determined by ordinary least square regression (OLS). The subject of regression is a subject worthy of a separate topic. The next topic is comparing two classes of subjects that we expect to be different because of effects on each group. This can be represented by the plot of means and standard deviations between patients with ovarian cancer who underwent chemotherapy and either had no or short remission, or had a remission of 20 months, defining treatment success (Figure 2). The result of means comparison is significant at p < 0.01 using the t-test (Figure 3). But what if we were to take the same data and compare the patients with no remission, small remission, and complete remission? 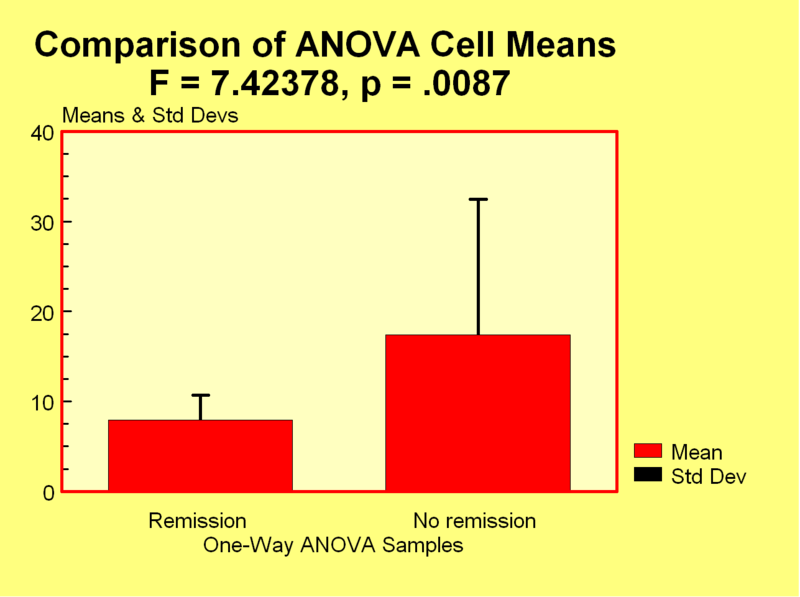 One would do the one-way analysis of variance (ANOVA1), which uses the F test (Fisher’s variance ratio). F is the same as t squared, or t is the square root of F. The result would again be significant at p < 0.01. This is a light review of very important methods used in both clinical and research laboratory studies. They have a history of widespread use going back at least 5 decades, and certainly in experimental physics before biology, although it is from biological observations that we have Fisher’s discriminant function, which gives a linear distance between classified variable, i.e., petal length and petal width. The discussion to follow will be concerned with tables and the chi squared distribution.